Today is the day for the September Edition of #PassTheScopeEDU and we're excited to make it happen! You're probably wondering why #PassTheScopeEDU is happening on a Wednesday instead of our normal Thursday? It has to do with our theme for September tying in with the International Day of Peace so it's on a different day. We are very excited about the topic this month and hope you all enjoy the messages. As a reminder, what is #PassTheScopeEDU and how do I take part? 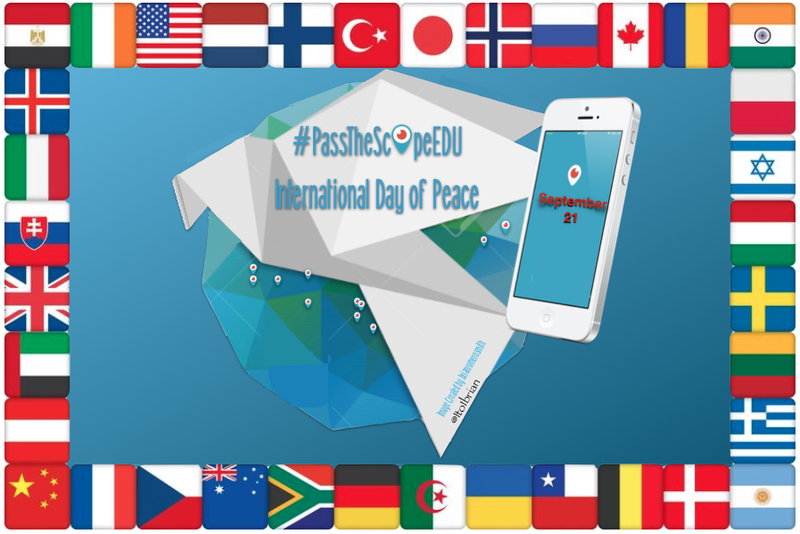 #PassTheScopeEDU is an event where educators use Periscope to create a live broadcast (called a Scope) and share their thoughts. Each person participating will be using their own Periscope account and those of us following along will use Periscope to follow and watch their scope wherever we want, making #PassTheScopeEDU a truly personalized PD opportunity.